Most businesses want to add their Facebook Page name to their e-mail signature right away. You don’t have to have your vanity URL yet to do this because you can hyperlink a long URL to simple text. 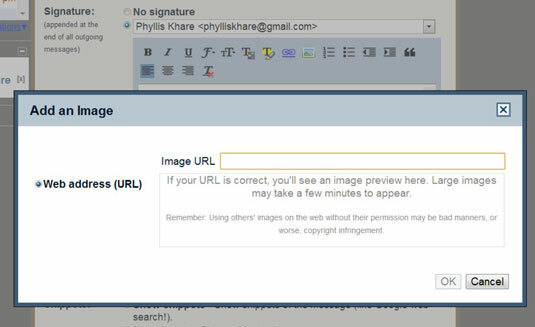 Follow the instructions for the e-mail client you use to create an e-mail signature that promotes your Page. If you use Microsoft Outlook 2007, follow these instructions. Other versions of Outlook will be similar, but it’s always good to check Outlook’s tutorials on how to modify your e-mail signature. Open Outlook, and sign in to your account. On the Options dialog box that appears, click the Mail Format tab. Doing so pulls up the Signatures and Stationery dialog box. Make sure that you’re on the E-mail Signature tab. Either select an existing signature to edit or click New to create a new signature. Editing an existing signature: Select the existing signature, enter your new text, select it, and click the Hyperlink icon. This pulls up the Insert Hyperlink dialog box. Type your Facebook Page URL in the address field and then click OK. Adding a new signature: Click New and a dialog box opens, allowing you to give this new signature a name. Name it and click OK. Then design your signature in the editing box. Again, to add a hyperlink to your Facebook Page name, type the name of the Page, select it, click the Hyperlink icon, and add the URL in the Address field. 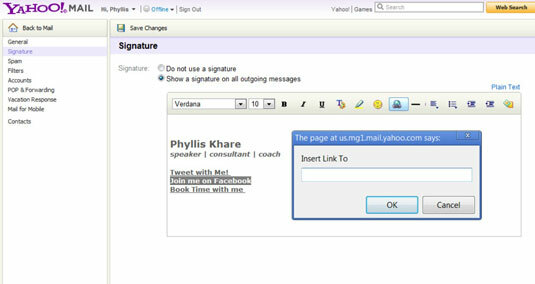 When you create a new e-mail message, your existing signature autopopulates in the new e-mail. 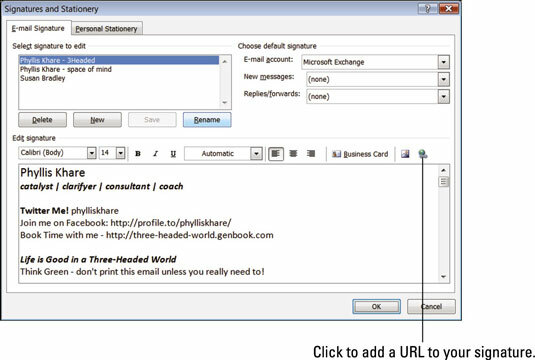 To change the e-mail signature from within the message, click the Insert tab in the new e-mail window, select Signatures from the Ribbon, and click the name of the new signature. Outlook replaces the signature in the new e-mail message with the one you choose. Open Yahoo! Mail, and sign in to your account. Click the Options link (in the top-left corner of the page) and then choose Mail Options from the menu that appears. Click the Signature link (on the menu on the left side of the page). You are now on the signature-creation page. Use the drop-down menu to toggle to Rich Text if the menu defaults to Don’t Use a Signature or Plain Text. Design your signature, and type the text you want to hyperlink to your Facebook Page. Select the text to hyperlink to your Facebook Page. 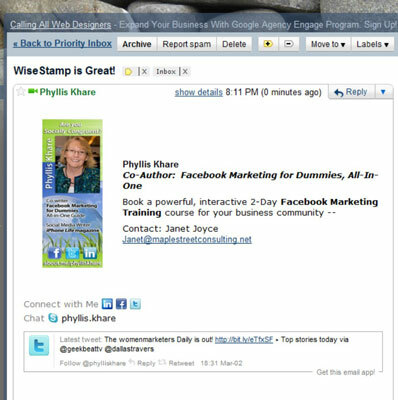 Click the Hyperlink icon, type your Facebook URL in the Insert Link To field, and then click OK.
Yahoo! supports only one signature per account at this time. If you use Gmail, you design your signature a little differently than you do in Yahoo! and Outlook. The good news is that you can add an image to your signature; however, you can’t upload it from your computer. You need to host images in the cloud — which means using a service such as Flickr, or even Facebook, to store the images online. Open Gmail, and sign in to your account. Click the Options icon (it looks like a gear) in the top-right corner of the page. The Gmail Options link may look different, depending on which browser, and which version of that browser, you’re using. The link may be labeled Settings. The Settings page appears and defaults to the General tab. Find the Signature section, and select the e-mail address to which you want to add the Facebook address. If you have only one Gmail address, you won’t see a drop-down menu. You can have as many signatures as you have Gmail addresses. Design your signature with your name and contact info. Enter the name of your Facebook Page, select it, and click the hyperlink icon. Type or paste your Facebook Page URL in the web Address field. In the Add an Image dialog box that opens, enter the image’s URL. This is what makes Gmail’s signature program different from the others. You can’t just upload an image from your computer. The image has to exist somewhere online. Gmail will connect to that address online and pull it into the signature each time you send an e-mail. If the image you want to use exists only on your computer’s hard drive, you can upload it to your Facebook album or to an image site such as Flickr. After you upload it, right-click it (Ctrl-click on a Mac) and then choose Copy Image URL from the menu that appears. Paste the URL in the Image dialog box. A preview of the image is there for you to check. All images online have an address or URL. You can use any image on your website or any image hosted on Facebook, or photo-hosting sites such as Flickr. Using other people’s images could be an infringement of copyright. Use only those images for which you have permission to use. You can also use an Internet browser extension or application to create a signature that contains a Facebook icon linked to your Page. 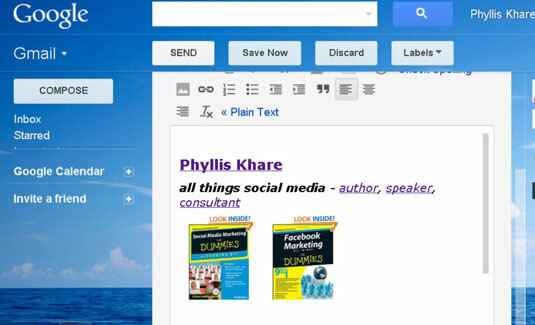 The best one we’ve found that works in all major browser-based e-mail is WiseStamp. When you go to WiseStamp, the site figures out which browser you’re using and shows you the correct download link. Then just follow the instructions provided. When your e-mail recipients click the Facebook icon, they go straight to your Facebook Page.